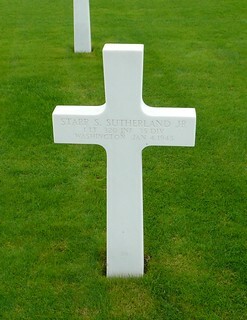 Starr S. Sutherland died on the 4th of January 1945. He landed on the Normandy beaches shortly after D-Day and first saw action in July fighting in the fierce battles amongst the Normandy hedgerows around St. Lo. We’d stayed in St Lo on my first trip to a battlefield and there’d be a few more of his postings where our paths would cross. He was involved in the fighting for Bastogne and Arlon both of which we’d visit during this trip. He also fought at Mortain-Avranches, Orleans, Sens, along the Moselle river, Nancy, Chambrey, Sarreguemines and the crossing of the Saar river. “he was killed instantly during vicious fighting in the village of Harlange, Luxembourg. He was interred with military honors (sic) at the Luxembourg American Cemetery and Memorial, Luxembourg, you should be be very proud to be the parents of this man. I know that you are and I know that this pride will sustain you in your grief over his unfortunate death." Much more poignantly his last letter home survives. It was composed two weeks before his death and is to his best friend, Ensign William Dehn. Just have a few moments - long enough to write a short note to let you know where I am and how things are. Also time enough to ask you to let me know how you and Jane are. Well Roomie, I've been on the Third Army front for almost two months and am ready for the armistice. I been in too many close ones to suit me and am now counting the days till this all is over and we're home again. It looks as tho you and I will lose our bet with the professor. He'll gloat over that - wait and see. I hope you have had opportunities to be with Jane. Marriage is a difficult problem during wartime, but probably not much of one for you too. You can't imagine how much my family enjoyed Jane and your visit with us that day. I don't have to tell you how happy I was to see you both. When I get married, we shall have to have many nights together. We'll have the wives prepare dinner - & the drinks for us while we lounge before the fireplace in our bare feet. Afterward, we'll wax you & Jane in bridge - or maybe you & I can beat the women. Life will be wonderful. All that has to happen now is for the powers involved to agree to cease this fight. You and I are doing our part to speed the victory. Well Bill, there's no other man any higher on my totem pole than you. You've known that for a long time. My very best wishes and luck to you and your Jane. Anytime there is anything I can do, Roomie, just say the word. I'm mighty glad to be a Fiji. The Starr Sutherland American Legion Post and Auxiliary #227 in Seattle, Washington was named in honour of Lt. Sutherland.